Being a weaver, bird nests have always fascinated me. I love how birds use natural and man-made materials to build these amazing structures. 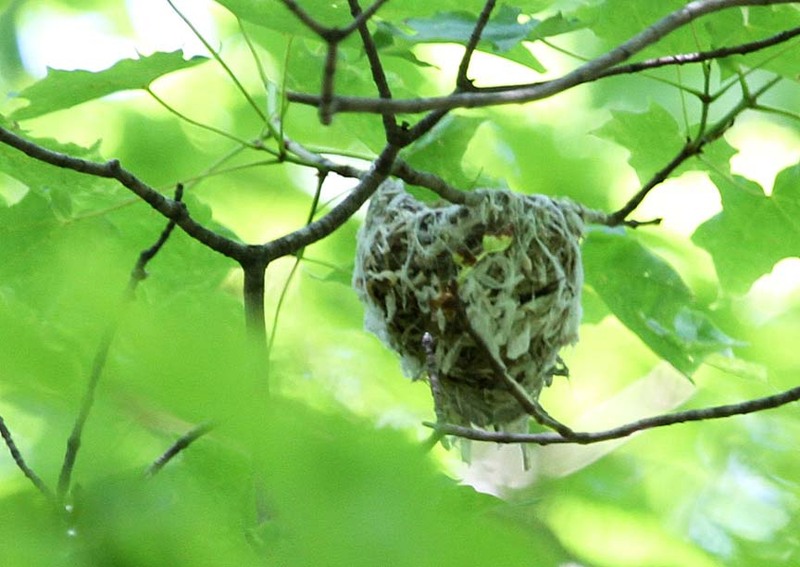 This Oriole nest looks like it's attached precariously to a branch. 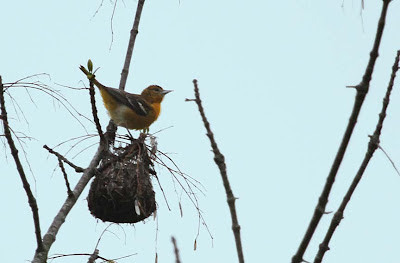 The female of this species does the nest building, usually going back to the same area as in previous years, but not re-using the old nest. She will take material from a former nest to use in the her new one. 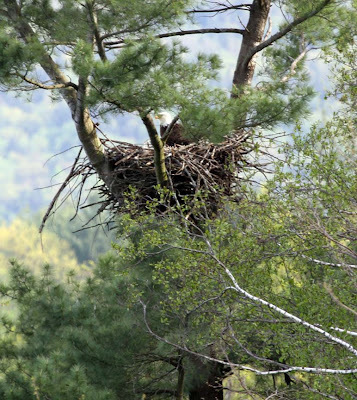 Bald Eagles build the largest nests or aeries of any North American bird. They will use the same nest year after year, adding material to it. Typically the nest is 5 feet across but may eventually be 13 ft deep and 8 feet wide, weighing 1 ton. One nest in Florida was found to be 20 ft.deep, 9.5 ft. wide and weighed 2.7 tons. This is the largest tree nest ever known. 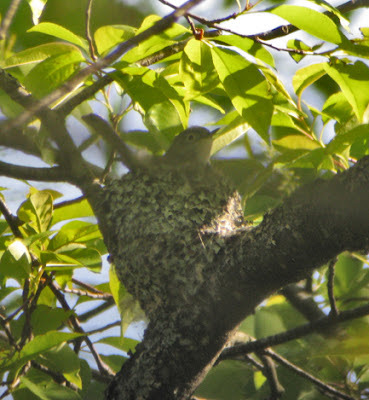 While observing a Gnatcatcher this spring, we followed her to the nest. It was well camouflaged with lichens covering the outside, mirroring the lichens covering the bark on the cherry tree where the nest was built. This Kingbird was sitting pretty on her nest. 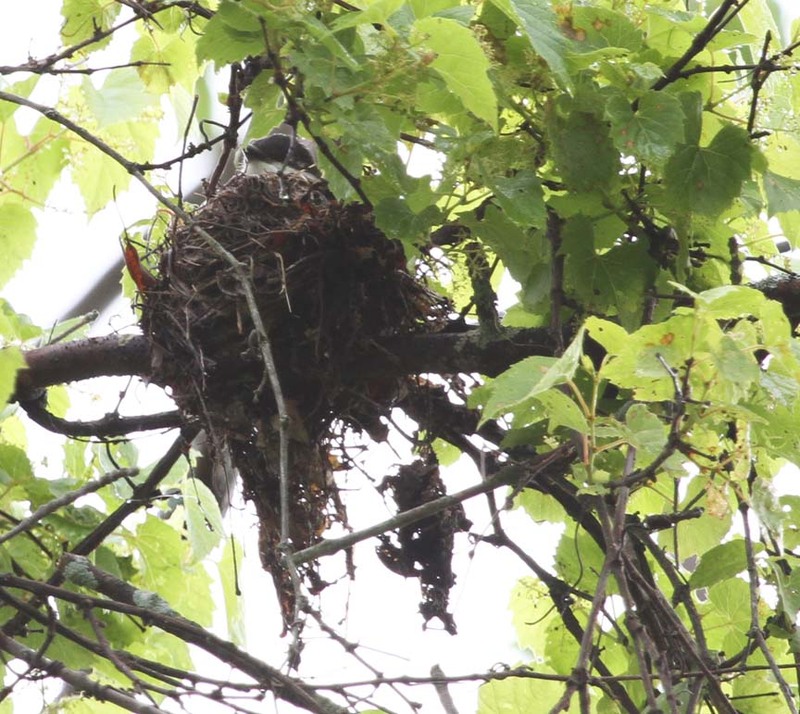 The Kingbird is one of a few who will eject Brown-headed Cowbird eggs from the nest. 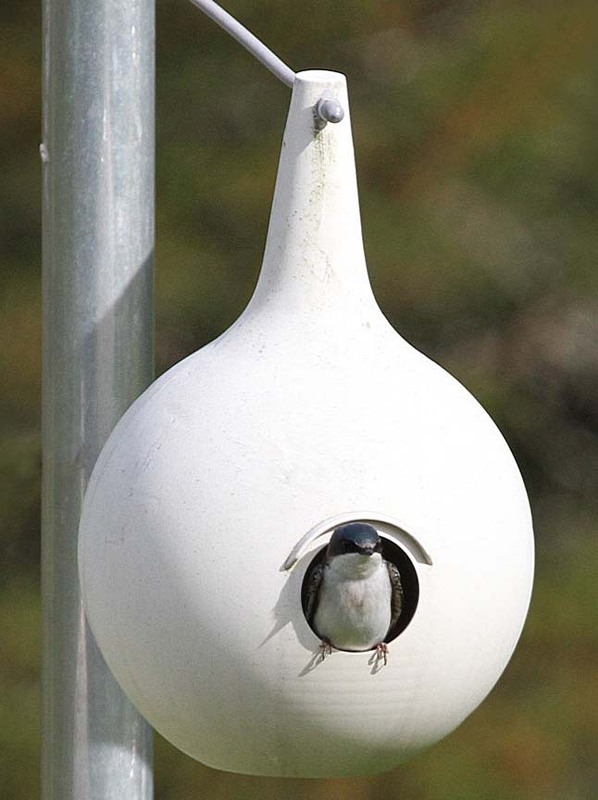 Cowbirds don't build their own nests but parasitize other nests. 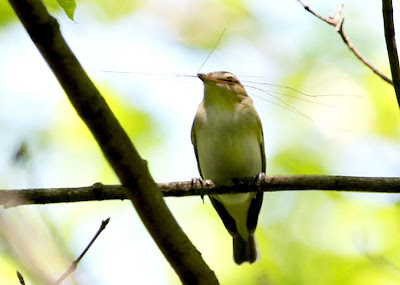 On a hike in the woods, we heard Red-eyed Vireos singing and saw this one with nesting material. 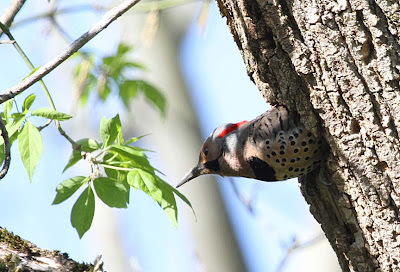 We followed her and found the nest she was building in the fork of a branch. The female Eastern Phoebe will build her nest on a sound structure, usually in a site protected from the weather. 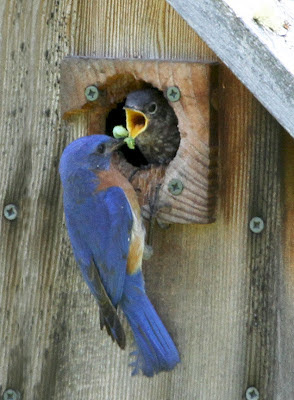 Phoebes will often re-use the same nest the following year. 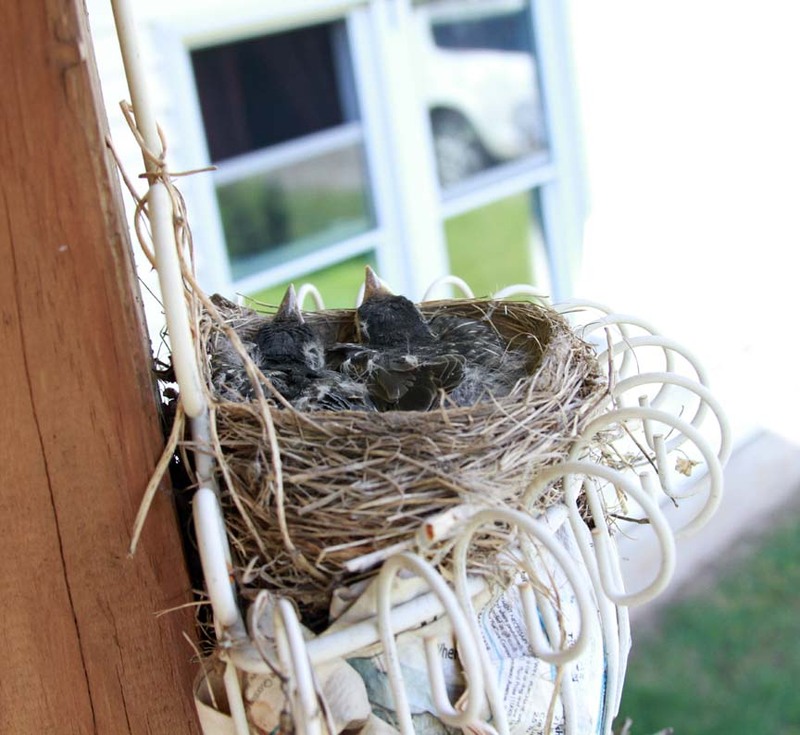 A female robin will often build her nest in unlikely spots but to her, it must have seemed a safe spot. Robins can have up to 3 broods in a year. 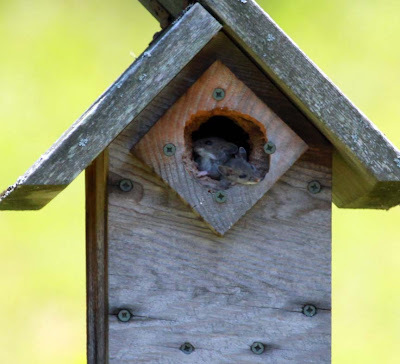 House Wrens may be small but they are fierce defenders of their nest boxes. I observed one this spring relentlessly attacking a chipmunk until the chipmunk left the area. Every time I go outside, I too, get scolded. 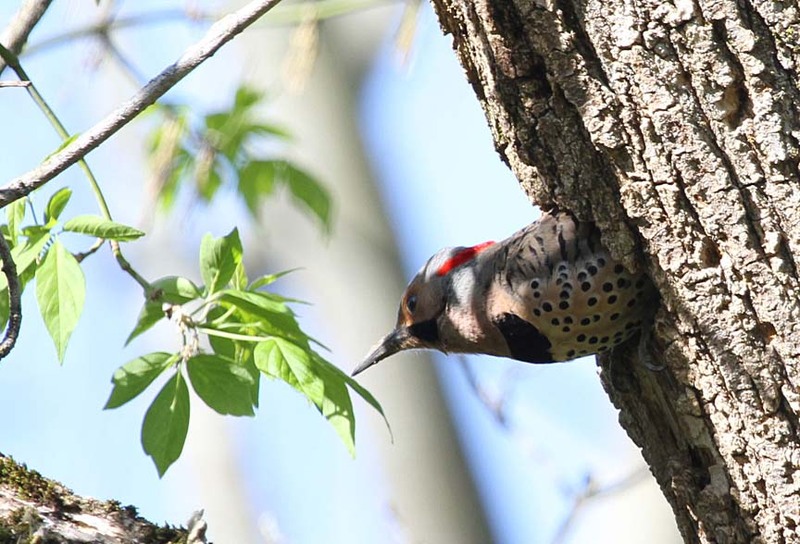 Both male and female Flickers excavate their nest cavity in a dead tree. 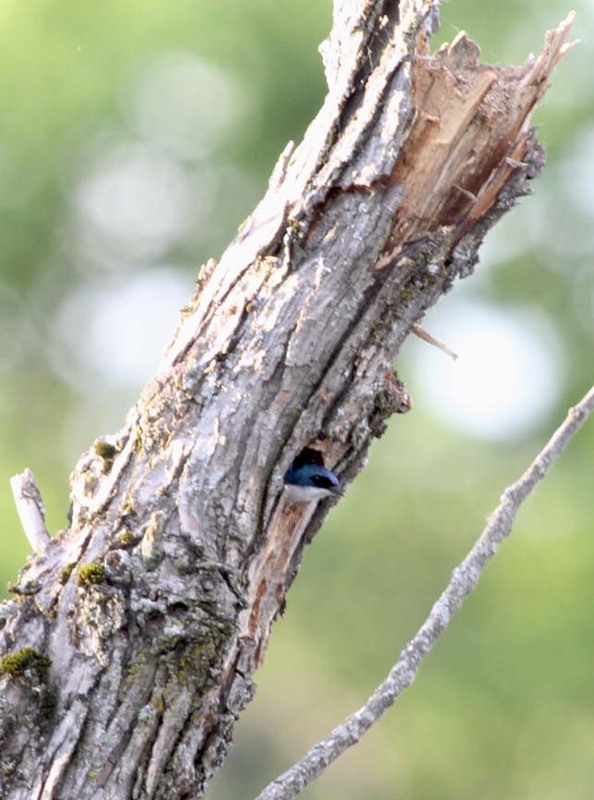 Even though we usually see Tree Swallows in houses around the edges of marshes and fields, they will nest in tree cavities. Unable to excavate cavities, they will use existing holes or natural cavities. Our Tree Swallows come back every year to nest in these gourd-type houses we put up in our field. So interesting. I've been following Redtail Hawks here in Phila.both online and in person as they nest on a window sill at the Franklin Institute Science Museum. Also the Decorah, Iowa Bald Eagles (online) and the occasional Robin nest here in town in Washington Sq. Park. Endlessly fascinating. Thanks for sharing.